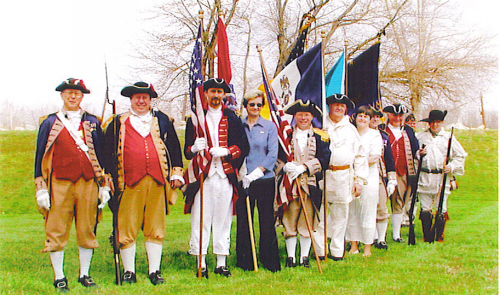 Members of the MOSSAR Color Guard and the Chairity Stille Langstaff Chapter of the Missouri State Society Daughters of the American Revolution, are shown here at the Pvt. John Colter Monument Dedication at New Havon, MO on April 2, 2006. Pvt. John Colter was a member of the Lewis & Clark Corps of Discovery. (L-R) Pictured here is Major General Robert L. Grover, MOSSAR Color Guard Commander; Captain James L. Scott, Frank G. Rifle, J. Bragg Stanley, William L. Groth, Jr. Brigadier General Stephen M. Baldwin, Alvin L. Paris and Captain Russel F. DeVenney, Jr., MOSSAR 1st Vice President.